Whenever I hear someone say, “that’s sooooo Camille Co” or when stylists tell me that the peg for their shoot is “Camille Co”, I can’t help but wonder what exactly they mean by that. I mean until now, even after answering countless interviews asking me about my personal style, I still find it so hard to explain my style in its entirety. It’s probably because I welcome so many different looks and styles. I dabble into a lot of them and make them my own in what little way that I can–just like this one. If you’re an observant little fellow, you’ve probably already noticed that a lot of my looks have blazers and jackets on them. Blazers will always have a special place in my heart. I think they contribute a lot in making an outfit look put-together. This is why I always consider them must-haves for every girl’s closet. Whenever I dress up, I try my best to put little surprises here and there while making sure they’re still in sync with my entire look and they’re not out of place. Here, with both my top and blazer in coral shades, paired with shoes and shorts in neutral cream colors, my little surprises came in the form of my accessories and bag. To make my look a little less predictable and much more interesting, I added more colors to it by piling on necklaces in purple and cyan, then finished my look off with a bright neon bag. I really like paying attention to little details like these. See how big of a difference they made? I could’ve opted for a monotonous outfit, but where’s the fun in that? Now that we’ve got my outfit covered, let’s talk makeup–the Camille Co makeup! (It still sounds so weird saying that haha!) I actually just got these makeup products from Laneige last week so let’s use these as an example. For those who are not aware of the brand Laneige, it’s a famous skincare and cosmetics brand from Korea. Whenever I go out and find myself too lazy to put on makeup, there are still a few things I just can’t skimp on. One of them is fixing my eyebrows. I’m Chinese so I don’t really have the fullest set of brows so this brow shaping kit from Laneige is great! It comes in a palette with 3 shades which you can blend to match the color of your hair. The kit comes with 3 eyebrow templates/stencils as well to guide girls who aren’t that good at shaping their brows. My sister would love this! I always nag her about putting on even just a tiny bit of makeup–eyebrows and mascara, that’s all I ask! But she always reasons out that she doesn’t know how to draw on proper eyebrows. With these templates/stencils, she can no longer escape! 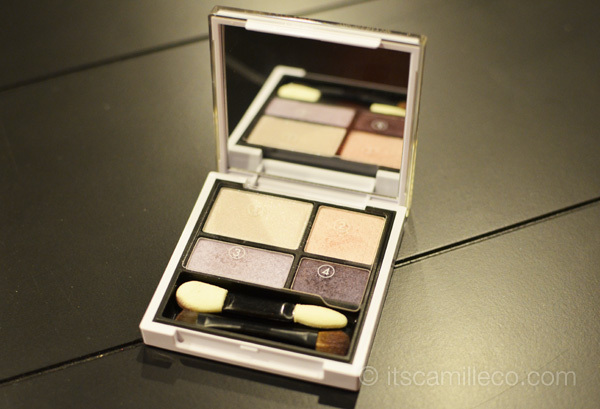 For my eyes, I tried Laneige’s The Secret of Snow Crystal Palette in MultiProf Shadow No. 3. It’s a mix of cream, pink and purple in satin finish. As I’ve mentioned before in my previous makeup tutorials how I like using palettes with 1-2-3-4 guides on them like this one. It’s how I learned to apply eyeshadow on myself! They’re really helpful! Anyway, so as with all 1-2-3-4 eye shadow palettes, apply the 1st eyeshadow all over your eyelid and below your brow bone. Apply eyeshadow number 2 on top of the 1st, make sure you are brushing from the outer area of your eye going inward. Do the same for eyeshadow number 3. You can apply more of this color but focus on the outer area of your eyes first then brush inward like how you achieve smokey eye makeup. Repeat the previous step in applying shadow #4. By focusing on the outer parts of your eyes and brushing towards the inner area of your eyes, more color sets on the outer area of your eyes, giving the illusion of bigger eyes. Don’t forget to use eyeshadow #3 to blend this darker color in with the rest. Last but not the least, line your lower lash line using eyeshadow #4. Tada! All made up and ready to. Whatever palette or eyeshadow I’m using, this is my go-to makeup. Easy as 1-2-3-4, right? 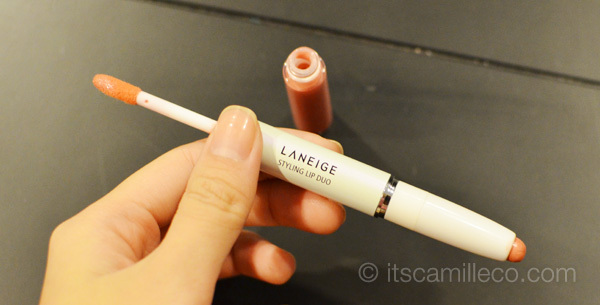 For my lips, I used Laneige Styling Lip Duo. It’s a 2-in-1 lip stick and gloss. As with all of Laneige’s products, this is extra moisturizing and satiny too! I love that it doesn’t feel too think as well. The color I used is Coral Beige which matched my coral outfit perfectly. There you have it! Just a super quick tutorial on my eye makeup. Once again, most of the items I’m wearing here, from the clothes to my makeup, are available at SM Mall of Asia’s BIG MOA Sale happening this weekend (September 14-16). Although I’ve already done my shopping at SM Mall Of Asia (as you can probably tell from my recent posts, har har), I’m still going back this weekend for more! I’ll probably pay Apple & Eve a visit again! It’s quite a revelation, right? They have the best tops perfect for business casual days! 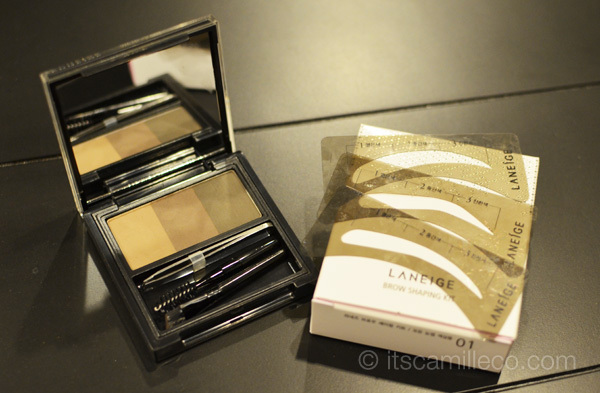 I’m looking forward to getting more of these Laneige beauty products too! For more updates on SM Mall of Asia’s BIG MOA SALE, follow @themallofasia on Twitter! Hey ate cam! What color are your contacts? Your so gorge by the way. Marami online!!! :) SM GTW has some too! I have noticed that you have clustered lashes on. Try something with lash extension, that they put indiviually with your natural lash. its much healtier and believable look. GREAT STYLE as ALWAYS!!!! tho. wow. I would love to grab some blazers now! haha. I always use cardigans lang kasi. but now, I will get some blazers for me. hihi. :”) I`m starting to love coral na. :P ahhhhh. I wanna eat your necklace. hahahaha. looks like candy. XD it`s really amazing how you add colors and it looks good. I am jelly. :D kidding. and, I love makeup. seems like I wanna have that eyebrow shaping kit. tooooo cooooool. :p and yes. I agree. it`s very useful for a palette to have a numbering and you`ll follow the instruction on how you`ll use them. You should! :) They do look like candy! what brand of lenses do u use thyre so pretty! Wild guess: high metabolism + always on the go. i’m liking the coral shades these days but i’m hesitant to wear one as i’m not so fair skinned. thanks for sharing those Laneige products. the brow shaping kit is very interesting as it will truly help me shape my eyebrows which i don’t know how! thanks also for sharing your quick tutorial on eyeshadow make up. i also have chinita eyes and i don’t know how to apply eyeshadow. My pleasure! The eyebrow shaping kit is also my favorite! Your make-up tutorial looks easy but I’m *always* afraid to put make-up on my face. I have this thought that maybe it’ll not look good on me but I know make-up puts magic and changes our entire look <3 Sana hair tutorial next time. Hihii. Thanks Charisse! :) Try mo lang! I used to know zero stuff about makeup as well! i know you have been wearing shorts all throughout these years, but honestly, this is actually the first time that i looked directly to your legs and not your outfit. i just can’t believe that only up to today have i noticed you have such amazing legs! 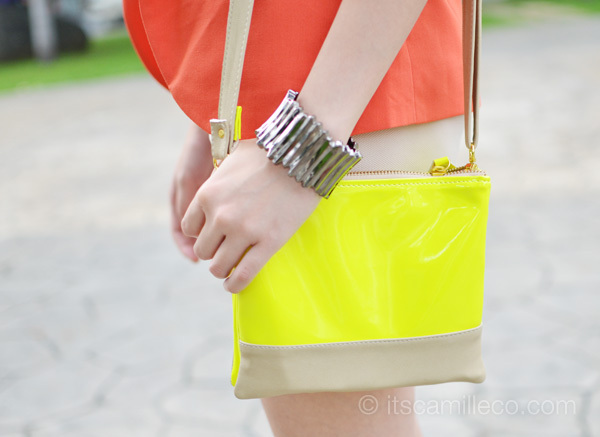 A “Camille Co” look is consists of fun colors and layering of accessories and clothes! Ms. Camile! I think you would look sooo adorable with curly/wavy short hair and your signature bangs! Thank you Ernest! That’s a cute suggestion! :) Maybe when I’m brave enough na! Whenever I and my friends go to the mall and window-shop, every pretty outfit we saw would make us shout, “Camille Co”, every shop we saw that you constantly mention in here would make us say “Brand of Camille Co”. And even my friend who isn’t a fan of fashion and everything that goes with it would really shout with us. And it happens everytime. As in EVERYTIME. It really goes to show you have something in you that is unique Miss. And really, blazers are so ‘Camille Co”. Me and my friends also use the phrase, “Very Camille Co” hahaha! Haha still not used to it! Very pretty outfit atsi! How do you handle pervs lurking around streets? Even though you’re in high street or any kind of sosyal place, you just cannot avoid them. -___- Especially when I’m wearing shorts like the one in your outfit. I’m tall also, so my legs are really emphasized! What to do!! HAHA random rant. I looked serious shopping haha except for the mini-dance thing I did real quick! :) Thanks Catherine! I did 2 shopping date giveaways na before. Just keep visiting my blog :) It might happen again! OMG! I just threw the receipt!!! :( So sorry!!! Yay! That’s so nice to know! I’m so happy!!! This so LOVE <3 . I love the outfit . I love the mix of prints and all the colours you use to create your outfits, you always look out of a magazine!! The color of that blazer’s sooo yummy! (Weird ba? Sorry) LOL :) But I really love this outfit, looks fun but still put-together, ikaw lang nakakagawa niyan. On another note, may I ask for an advice? I’m planning to buy a designer bag and I’m torn between a Prada Gauffre and a Balenciaga. Which do you recommend? Thanks in advance and more power! Both are equally pretty. Mas mabigat lang ang Prada :) Thanks Ayeen! ugh! I’ve seen those shoes on other people but I must say, you wore it best! :D Your feet is so perfect! Not payat kasi eh and its size is proportional with your height! Have you seen the new iphone 5? Parang there’s hardly any difference naman compared to 4s. I think Samsung “overthrew” Apple na when it comes to mobile phones! I’m still an Apple girl although Samsung is nice nga :) I haven’t seen the new one but I’ve read about it :) Still excited though! I like the way you combine outfits and make it look put together, hope you can give tips on how to do such,. And the color combi as well.. .
Haha yes! :) Thanks Jane! Love the this outfit so much, it’s perfect and that blazer gorgeous! wish I can wear this kinda short. Beautiful as always!. :) I didn’t know how to put eye shadow on me. I always ask help from others but now I think I should try it…thanks Ms. Camille! Thanks Precious! Hope this helps! I super love your outfit! I love your blazer! awww thanks Jhaycee! :) You too! Thank you Lyn! :) Candy Fair perhaps! Actually, i’m kinda scared to wear blazers cos i think blazers make a 17 yr old girl like me looks too mature?… I’m just scared i’ll end up looking like an office lady among my friends :S but i really want to try to wear one especially seeing u being able to pull it off so fashionably and elegantly!!! That legs is to die for!! How I wish I have long legs as yours. :-) Anyway, coral looks on you.. Lalo kang pumuputi. hehehe. Same with you, I also love blazers especially when it is not the usual colors..Neon colors are in! Love love love everything Ms Camille. What day are you going to MOA? Just want to see you in person <3 and take some pictures of me and you.. Dark colors, vertical stripes, color blocked clothes that are darker on the side :) Thanks Erika! Camille Co style is classy, put-together, very feminine and not at all tacky. You’ll never see any thread hanging, no hints of gusot, in short, you can dress like royalty when you dress like Camille Co. Yii, are you getting all kilig already? Hehe. You are truly sublime in this outfit and in all the others too! GREAT blazer and I’m SO IN LOVE with that purse! Style wise? yeah, I’d say that this post just about summarizes your iconic style; blazers, high waistline and pops of bright colour on your accessories. Thanks Mark! I would do! Haha! He’s really a fan!!! When we go shopping, he pick some outfits inside the store and tells me that you should get this coz its so “Camille Co”!!!…OMG! I just laughed and thinking, do i really have a boyfriend?? hahaha LOL… <3 u Camille! Hahaha :) Thanks Again Anj! I agree.. even at work, my guy officemates are now making it there habit to check your blogs when they sign on to the net. Last night, I was wearing a navy blue polkadots semi-long skirt and a beige top. I paired them with a red belt and flats, and a silver gray envelop clutch. I was surprised when Eric said, “Camille Co look-alike”.. haha! They are becoming so gay because of your fashion. Really funny..
great outfit !!! i love the shirt & the blazer super gorgeous !!! Haha they do remind me of food! This outfit is so beautiful,Camille.I really appreciate that you’re not afraid to put colours in your outfits.I’m like you and I have to admit that the colours are so important in an outfit. Also,thanks a lot for the tutorial. Colors are wonderful! Can’t imagine my closet without them! :) Thank you Andrea! I know what you feel! I can’t have enough of blazers!